This post covers the Characters section of the Shenmue art book. Several key characters to appear in the the first two games are introduced, as well as one that notably still has yet to appear. 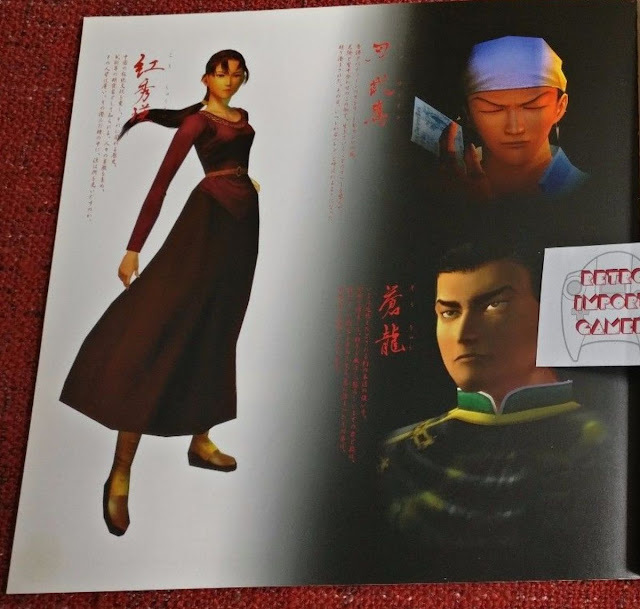 Related post: see our previous post for an overview of the contents of the Shenmue art book. You will notice that some of the character descriptions match those in the Shenmue I and II English-language manuals. For the other characters, the translations from Japanese are my own. "Having lost his mother at an early age, Ryo has devoted his entire young life to rigorous martial arts training under the guidance of a strict but loving father. Despite a tendency to be reckless and a bit too quick to fight, Ryo has a tremendous amount of potential and an iron-strong volition. Determined to uncover the mystery of his father's murder, he begins a journey that will eventually take him west to a land he has never seen... China. What fate lies in store for Ryo?" "Shenhua grew up in China surrounded by mother nature. She has courage combined with strength and a mysterious innocent expression. Shenhua is pure, if a little naive, she never doubts anyone and is very kind. Her destiny will change forever when she encounters Ryo." It is interesting that the two butchers are specially picked out for mention among the many shopkeepers Ryo comes across in Hong Kong. The description hints that perhaps they were originally destined to play a larger role than in the completed game. 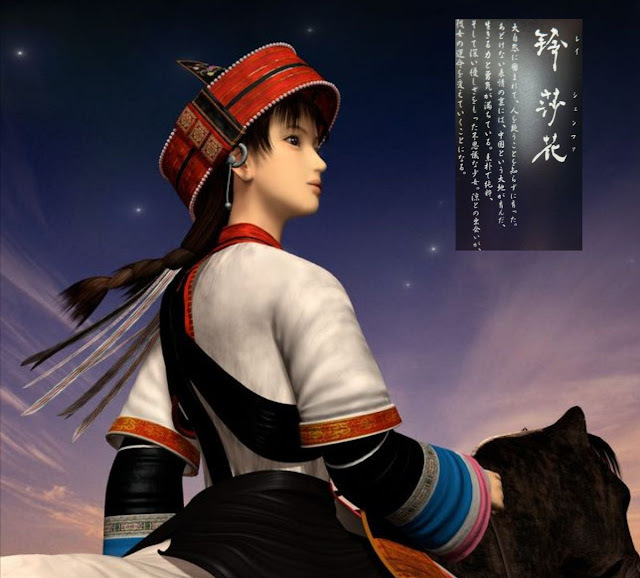 The character of Niao Sun was revealed in the promotion of the first Shenmue game. Will she at last make an appearance in Shenmue III, or will it be further in the future? "He is Ryo's father and the foremost expert of the Hazuki style of martial art. In his youth he traveled to China to undergo martial arts training and during this time he met various people. Because of his deep devotion to martial arts, both Iwao and his school of martial arts are held in high regard and well-respected in the community." Yuanda Zhu is given a positive description here, although in the first two games his character comes across as ambiguous. "Xiuying is fond of Chinese tradition and culture. She is well versed in Taoism, history and martial arts, specializing in literary and martial arts. Xiuying is a very thoughtful person and always thinks ahead before taking action. She does not speak much, nor does she show much expression, but it seems she hides a great deal of sorrow in her beautiful eyes." "Ren is the leader of the Heavens, a street gang which has its own territory in the Beverly Hills Wharf. He is charismatic and both his words and actions lead the way. Ren doesn't trust anyone, and is obsessed with money. He is also quick-witted and good at gambling." "Lan Di uses a mysterious martial art which is said to have been lost. His cruel eyes outwit his enemies, who soon lose their fighting spirit. Those who fight back are harshly defeated with his immortal fist." Keep an eye out for the next Shenmue Art Book post, which will analyze some of the little-seen art and images from the "Making of Shenmue" chapter. An article in the January 1999 edition of the Japanese Dreamcast Magazine enthused that the art book's quality "must be seen to be believed". If you are looking to add the Shenmue art book to your Shenmue collection, there is one listed on Ebay right now from our friends at Retro Import Gamer.